« Are U.S. Kids Spoiled Rotten? 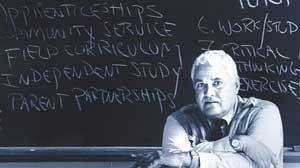 John Taylor Gatto was a teacher for nearly 30 years, including working with disadvantaged youth in urban New York City public schools. He was named New York City Teacher of the Year in 1989, 1990, and 1991, and New York State Teacher of the Year in 1991. That was the same year he wrote a letter announcing his retirement, titled “I Quit, I Think”, published in the op-ed pages of the Wall Street Journal. In the letter he wrote that he no longer wished to “hurt kids to make a living”. He has since gone to a second career as a writer, speaker and advocate for unschooling, and I have read several of his books and heard him speak twice. I’ve come to believe that genius is an exceedingly common human quality, probably natural to most of us… I began to wonder, reluctantly, whether it was possible that being in school itself was what was dumbing them down. Was it possible I had been hired not to enlarge children’s power, but to diminish it? That seemed crazy on the face of it, but slowly I began to realize that the bells and the confinement, the crazy sequences, the age-segregation, the lack of privacy, the constant surveillance, and all the rest of national curriculum of schooling were designed exactly as if someone had set out to prevent children from learning how to think and act, to coax them into addiction and dependent behavior. Unlike the more politically progressive John Holt, who is credited with developing the original conception and framing of “unschooling”, Gatto is more libertarian in his thinking, and tends to be critical of John Dewey, progressivism, and the whole mechanism of social-engineering that this “ism” has fostered since the 19th century. Chief among American social-engineering crusades, Gatto is critical of the U.S. public education system, conceived by Horace Mann and others in the early 19th century. Critical of a system featuring from its infancy an overarching standardization and top-down control of the learning process of America’s young people, at least those that were not part of the economic and social elite that continued to have their kids tutored or sent to private schools. Being a technical writer myself, concerned always about the precision of the words I use, I wrestle with Gatto’s choice of the word “genius” here. The conventional meaning of the word references extraordinary intelligence or skill, so being “extra” or beyond “ordinary” generally means that most do not by definition possess it. 1. Someone possessing extraordinary intelligence or skill; especially somebody who has demonstrated this by a creative or original work in science, music, art etc. 4. (Roman mythology) The guardian spirit of a place or person. 5. A way of thinking, optimizing one’s capacity for learning and understanding. The last three speak to something else that is perhaps more universal or at least in “abundance” per Gatto. It seems to me that every human soul that is born on our planet has the innate potential to take at least, to use astronaut Neal Armstrong’s quote, “One small step for man”, which depending on the fortuitous circumstances of its place and time can become, “One giant leap for mankind”. Then what about defining genius using the analogy from Roman mythology of being the “guardian spirit” of a person. Each human being being possessed by a unique consciousness that if allowed to fully flower, can produce a “gift” to the world that possibly no one else can give. Finally, the definition of genius as “optimizing one’s capacity for learning and understanding” is totally applicable to every person. Imagine a world where every human being’s capacity for learning and understanding has been optimized. What a world that would be! So I accept the abundance of “genius”, particularly in its less common definitions. That said, I am aware that many other people, including a number of progressives (including some I interact with on the Daily KOS progressive blog site), do not. They tend to have a more pessimistic (they would say realistic) world view, believing in a scarcity of genius among humans. In this world view, the scarce genius of the few needs to be captured and made required reading for everyone else, thus the argument for education in “the classics”, the “Great Books”, and more recently the “common core” curriculum. If you are thoroughly schooled in other people’s genius, your own genius, or lack there of, is not as critical. So if you do accept as I do the “abundance of genius”, then is Gatto’s a fair assertion that standardized, mandatory schooling is likely to at least limit the genius in many young people? Particularly the ones that are round pegs that do not fit into those square standardized holes? Do all the “bells and the confinement, the crazy sequences, the age-segregation, the lack of privacy, the constant surveillance” diminish the opportunities for genius to emerge? I would say yes, particularly when school has become an institution where you are mostly told what to learn, when to learn it, where and how the learning will take place, and who (not you) will be directing your learning process. The reason why you are learning what you are told to learn is often lost in all these other prescriptions, other than “you need to learn this to get into college”. Any one of these factors may not be calibrated correctly for you to pursue your own genius, and you have little or no access to the control panel. After spending 17 out of 18 years in formal schooling from first grade through my first college degree, I really had no sense of how I could uniquely contribute to the larger world. I feel that somehow at the end of that long journey I had diminished, rather than enhanced, that spark in me to make a unique contribution to the world. It would be another decade until I would finally gain (or regain) a full sense of what I could uniquely do in the real world. I would say it was around age 40 when I finally started finally identifying and being acknowledged for my own unique gifts, which might qualify for at least definition three through five above as “genius”. For me it emerged in my paid work as a systems analyst designing interfaces to move data between the company’s various computer systems. Interfaces that were “smart” and “bullet proof” enough to report on any issues but also pick up where they left off when any system failure might abort the data sharing process. Interfaces that were also conceptually simple, completely documented and easily maintained. Not game-changing stuff like a scientific breakthrough or philosophical reframing, but my own little unique contribution to the “knowledge infrastructure” of one small aspect of our high technology society. It also emerged in my volunteer work as a lay leader of a Unitarian-Universalist congregation, becoming very adept at meeting facilitation and group work session process skills. A unique array of skills I employ every day now in my paid job as a business analyst, where I’ve developed a pretty unique ability to manage an online work session using web conference tools (we use Webex), keep all the other remote participants fully engaged in the session while also taking notes and updating the documents we are creating online for others to see. Again not game-changing, but leveraging a brave new world of electronic communication technology to bring a company’s knowledgeable experts together from around the country to synergize their knowledge towards solutions for the company. Now perhaps these are skills that I could not have become vested in any earlier in my life. But looking back, those seventeen nearly straight years of classroom schooling did very little to even clue me in that I had these skills, let alone help me in developing them. “What ifs?” are always very difficult to try to speculate on, given the myriad of influences and other factors that make up an individual’s developmental path. But I think that I can accurately say that there may have been only one teacher along that seventeen year schooling arc that ever gave me any real mentoring on my unique skills. For the most part my educational ordeal had me convinced that I was just another person, no different than anyone else, being “trained up” to fill a spot in the adult world that many others could fill just as competently.